Turns out my Student Leaders are very optimistic about the world and they love to draw on the white board. Here is how it worked. First I showed the Lost Generation clip from YouTube. It starts off seeming like a very negative video but changes half way through to be very positive. The link is above. I then invited the class to write down as many things as they could that are great about the world right now or they see as positive for the future. 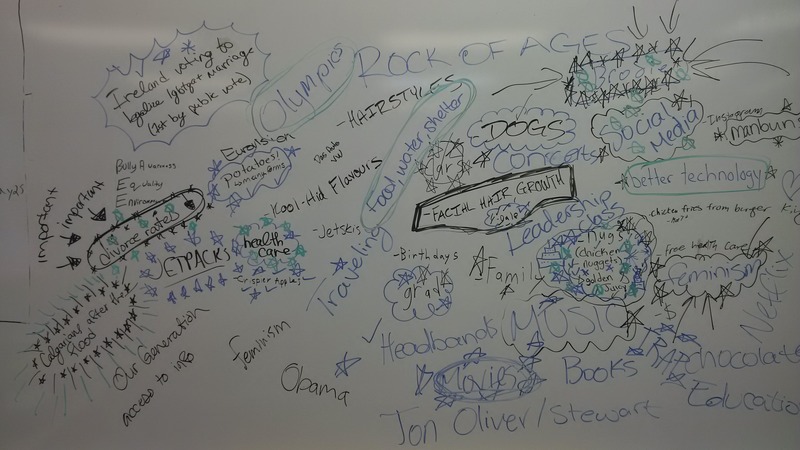 Then they were encouraged to come up to the whiteboard and write everything positive down they thought was important. When that was done they could come up and show what they liked that other people wrote by circling it or putting stars beside etc. What we got as you can see from the picture above was a very messy, awesome declaration of optimism by my class. They kept talking about all the things they had written down well into the rest of the class. Give it a try! Now I am going to go outside and positively enjoy the 30C weather we rarely get in Calgary this time of year! This is my friend Braeden. He is a Leadership superstar at Centennial. He is also one of the most positive people I know. He was wearing this shirt the other day and I had to take a picture. I love the idea of a Thumbs Up Thursday. Say yes to all the good things in our lives and opportunities that may come our way. 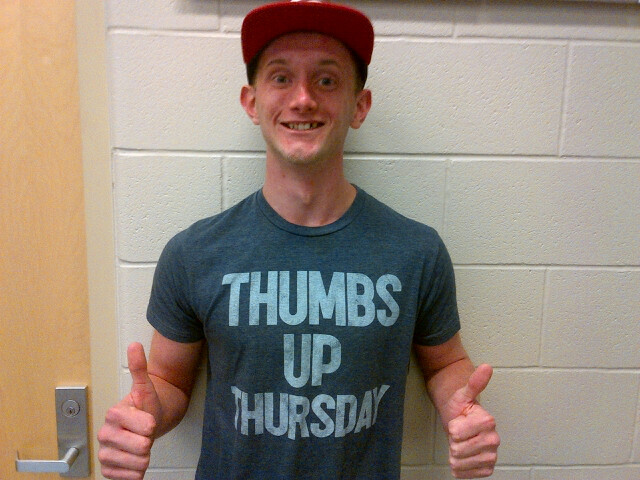 We are starting to promote Thursdays as all about the thumbs up. Be positive, say yes to opportunities, and spread the enthusiasm. May your Thursdays always be Thumbs Up!! Centennial High School has partnered with Samuel Shaw Middle School, one of our feeder schools, to run a Study Buddy program. Our Gr. 11 and 12 Leadership students meet once a week with Gr. 5 or 6 Students at S Shaw. This is the fifth year the program has been running. Last month when we arrived at Shaw we saw a number of post it notes up where the Gr. 6s were sharing things they love about their school. They talked about favorite classes, lunch, recess, and other cool activities at school. Two of the notes talked about our Study Buddy program. I was so impressed that with all the things they could highlight they chose their Study Buddy. 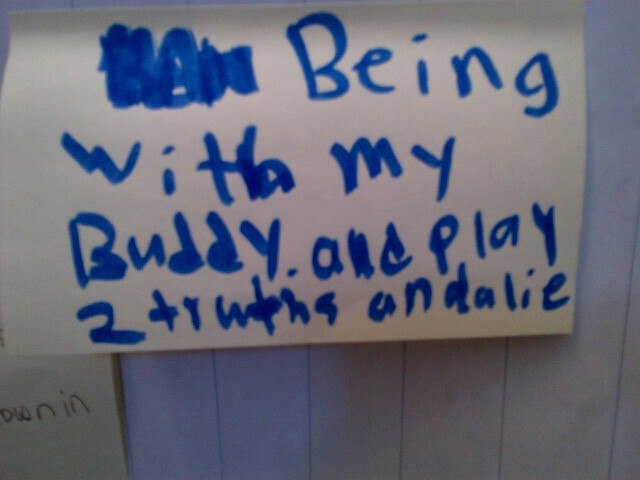 The first note says “Being with my Buddy and playing 2 truths and a lie”. 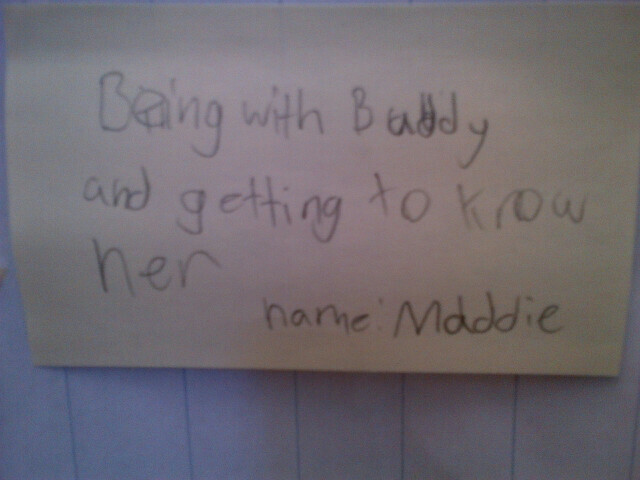 The second says “Being with my Buddy and getting to know her”. How does our program work? We go once a week with our class (Wednesdays) for 45 minutes. My students come with a lesson plan or activities for the day. We consult with their teachers before as to what to work on. In the past we have done science, social studies, reading, and math. We have also worked on social skills or English as a second language. This term we are working with the theme of positivity and appreciation as requested by the Gr. 6 teachers. Last week they got in groups of 4 and put positive post it notes on each other’s backs supporting that week’s theme of validation. It is critical to not give their teachers more work with another program. They give us general ideas and then we do the planning and work. Program Rewards – When we arrive at the school everyone recognizes our students in their Leadership T-Shirts. Former Study Buddies high five me in the hallway. There is an excitement from the Gr. 6s to meet with their Buddy. My Leadership students feel like they are doing something real and important. They come with a plan and work hard to make a difference with their buddy. It is a highlight of every week for me to be a part of this program. Consider starting a Study Buddy program with one of your neighborhood schools. Sometimes an old Leadership idea has new and unexpected results. Our Gr. 10 Leadership class decided to take Mark Scharenbroich’s idea of “The Stars Come Out” and make it into a St. Patrick’s Day idea. We cut out 2000 green coyote paw prints and put every one of our staff and students names on their own individual paw print. On the 16th after school we put all of the paw prints up so that they filled the main hallway and make an impression when students came the next day. On St. Patrick’s Day everyone had a paw print to go find. Many of the staff and students took their’s home or put it at their desk or locker. Cool Story – A parent told me that evening he saw a green paw print on his son’s bedroom wall and asked what it was. He was told that the Leadership class had put up everyone’s name. He spent every class break and lunch looking for his with no luck. Right after school he noticed a section he missed and there was his name. He told his Dad that he shouted out “I Exist!”. He then brought his paw print home. Students want to feel connected to their school – they want people to know “I Exist!” There was more social media traffic about this activity than any we have done in the last two months. 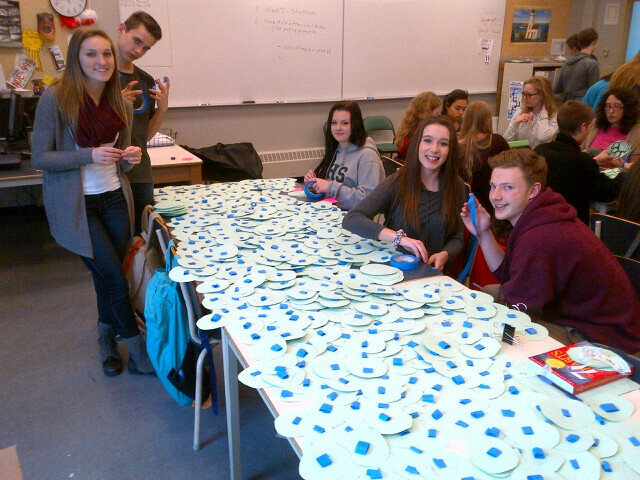 Build Connections – as Mark S says “Connect The Dots” Below are some of our Leadership 10 students with the paw prints. They covered six tables. Nice Bike Lead 10 Yotes! Can A Short Note In A School Locker Make A Difference? Yes!! A student came to me yesterday and asked if she could speak to me outside of class. As we went out she started to cry. Her grandfather had passed away the day before and that is why she was away from school. She wanted to tell me that when she came back that morning she found a note in her locker that said “The best is yet to come!” from The Coyote (our school mascot). She then told me how this short note had made her day and wanted me to thank the leadership class responsible. I share this story with her permission. One of our Sr. 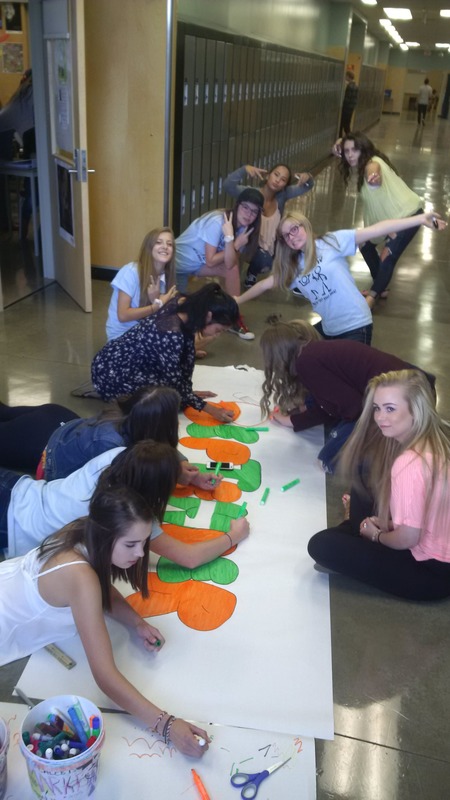 Leadership classes came up with the idea to put a positive note in each student’s locker this week from the Coyote. I thought it sounded like a great idea. Who knew the impact it would have on this student. It made me think that the positive things we do in schools do make a difference in a way that sometimes we never know. Keep on doing what you do. So much to study, so little time (we feel you) GOOD LUCK ON FINALS! It Snows Sept. 9 ??? Make Snowmen! On Sept. 9 Calgary woke up to about 3 inches of snow. I may live in the Great White North but this was too much! We had our Leadership kickoff retreat happening that day. One of the activities that day was happening on the field. So we adjusted. If it snows, make snowmen! Something that seemed like a downer turned out to be awesome. 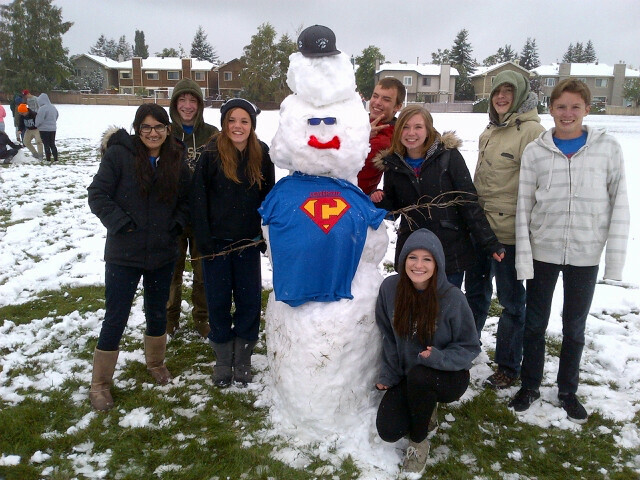 The students had so much fun seeing who could make the best snowman. There were some pretty creative snowmen. The best part is the great memories we made that day. We will be taking this picture and putting it on a poster with the caption “If it snows, make snowmen!” and hanging it in the leadership classroom. What started out as kind of depressing now is a part of our program’s culture and history. So here is hoping it doesn’t snow too soon on you, but if it does, make snowmen!